In this post I'm going to explain a little bit more about how Relocations and Symbols work. We talked about the symbol table specifically in the previous post, but weren't fair about why Relocations are needed and who they are used. When compiling and linking a program; the attributes used in each component object is placed at a given offset away from its original position in the final object. The ELF format records this offset and a mechanism for its resolution in Relocation records. 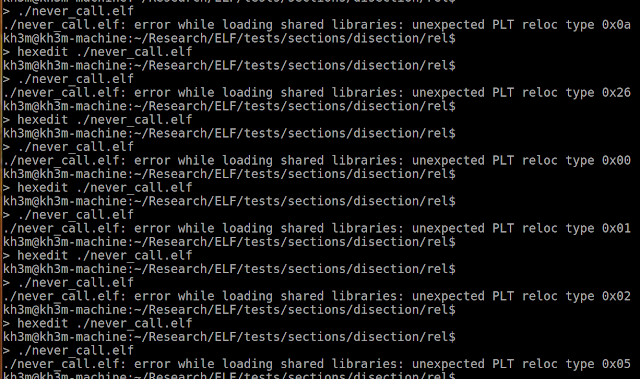 Relocation records hold information used by various utilities to help aim at the right part of the Elf file containing the definition of a symbol. It also allow compilers and C developers to extend the functionality of symbol resolution - with extra hooks and plugins and what have you, so like exploit dev but except you actually want to write to a function pointer with data lol. So symbol information, but for symbols themselves! Relocations can take on a number of types subsets of which are colloquialized and implemented across architectures - so many archs will have their own symbol resolution mechanisms applied to the relocation record format discussed here. Besides this already sparse field of definitions; relocation records (referred to as "relocs" from here on out...sometimes) are used for various reasons through a programs life cycle. Some relocs are used to prep the runtime, others for plain old dynamic linking and lazy loading and there may very likely be more yet defined and unmentioned functions. Lets take a look at how this Relocation format works and which sections are meant to hold information for it. other types exist but I find they are rarely used or hard to find examples for. rela with an "a" at the end; indicates relocation with the addend fields are used in the section. 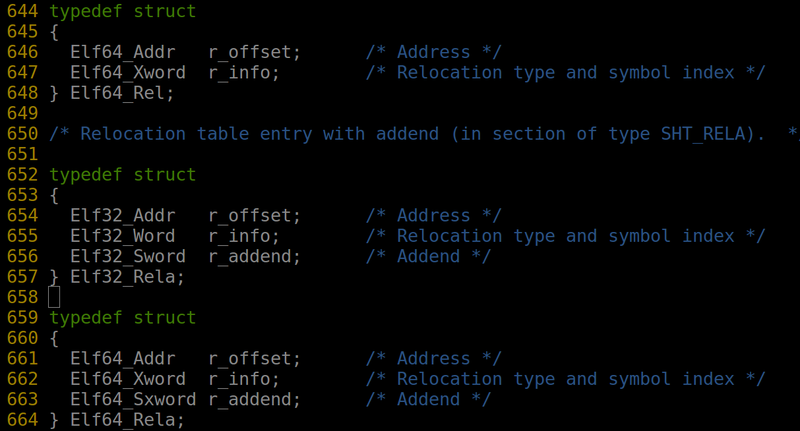 Relocation with addend is the one commonly used on x86_64 it seems; although the actual r_addend field is almost always 0 - glibc also maintains some flags to configure whether this field is used as part of the relocation. Basically that means, you will see relocation with addends used in "format"; but the actual addend will most likely always be set to 0. Which is more effectively just a normal reloc but with a NULL word at the end of each one. Potentially useful depending on how code trusts that NULL at the end when it loops through records. 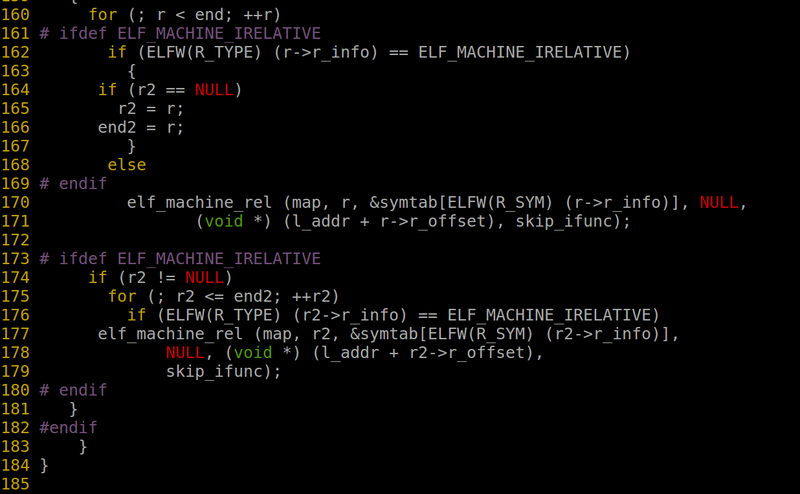 Elf64_Addr (8 bytes wide) r_offset - the offset to the final function. this could hold a number of different kinds of address values or offsets that aid relocation resolution. I expand on these a little later on this post, but to be fair to them please check out the documentation on this. 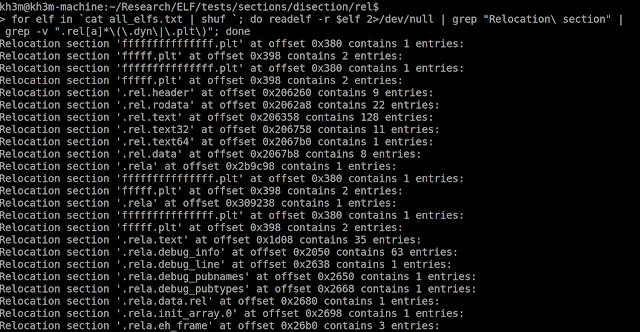 Elf64_XWord (8 bytes wide) r_info - a bit field the run time will pull through some macros to determine the kind of relocation being defined. The field holds typing information for the Reloc entry as well as the symbol index it is meant to refer to. Quite crucial a field because if you can write to you can make relocs point to different symbols which is pretty powerful depending on context. 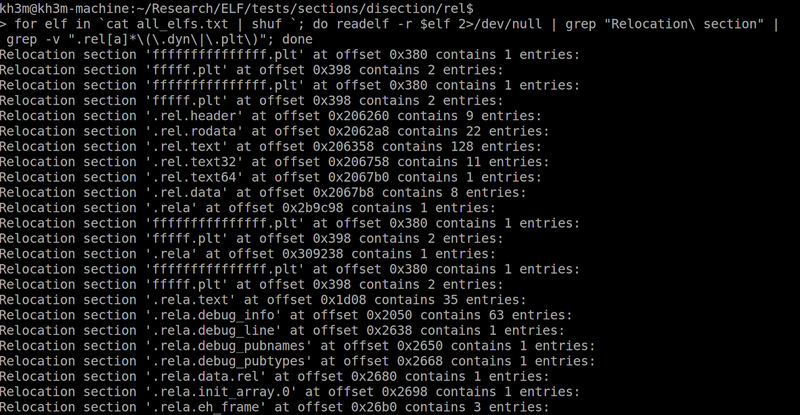 Nothing too fancy, the r_info field (as with many C-esque ELF Metadata *_info field things) is just a bit field that gets pulled through some shifting / anding operations to isolate the bits that are contingent on certain properties of the field. We know what a C program will most likely use in terms of its own terminology but what does the format actually look like in raw hex? 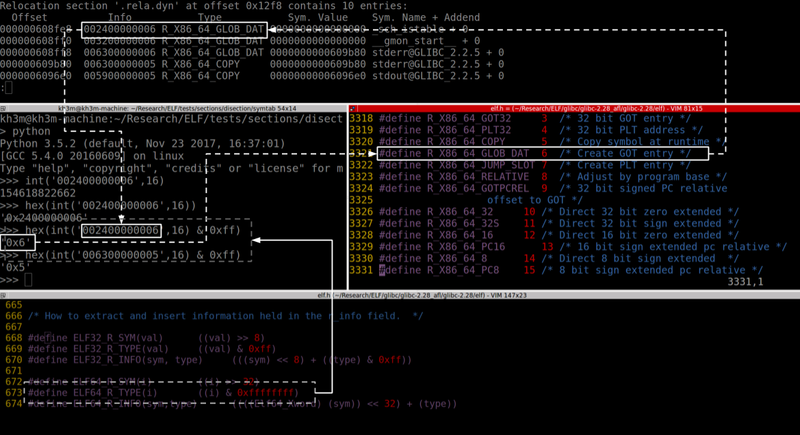 One can see the extra NULL 8 bytes at the end, this is the r_addend set to 0 - you will now know why readelf mentions the addend value but its almost always 0. Color choice was on point with this one. Clearly this section provides some insight on how the JUMP instructions that point to the GOT work. 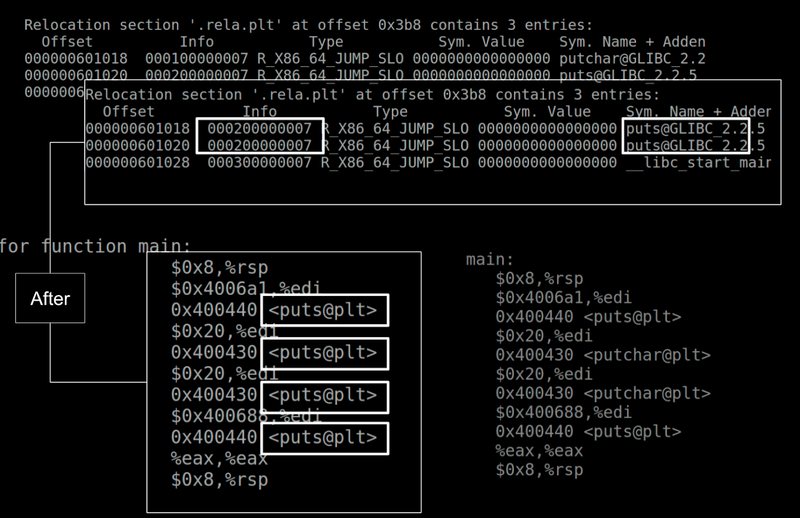 I believe that R_X86_64_JUMP_SLOT entries are specifically for preparing the PLT jump gadgets. Anyway all these beautiful fairy tales about Elfs make great bed time stories for unquestioning children; but lets see if the format is really treated this way. Next section looks at some of the horrible things that could happen when someone messes with the reloc metdata. Lets see which evil spirits we can summon by flipping some bits in the reloc format for an Elf. In the screen shot I'm trying to show what the picture was before and after editing the relocation metadata. 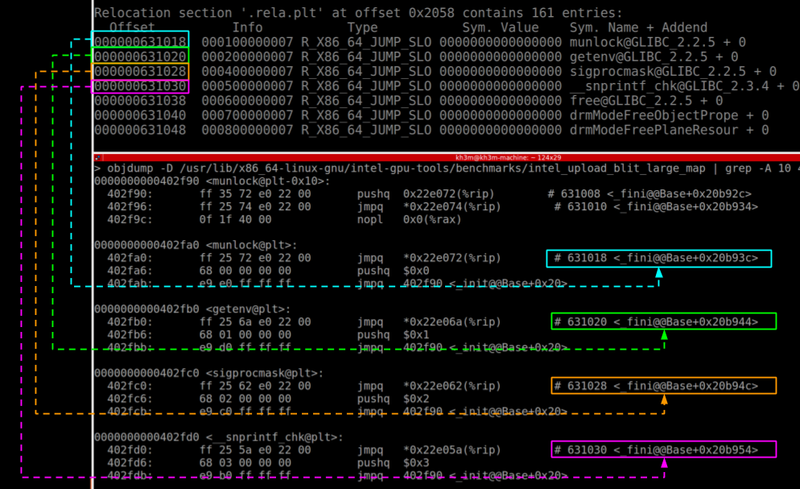 We can see here that gdb actually feels the affect of the reloc because it used it on the symbol for putchar. 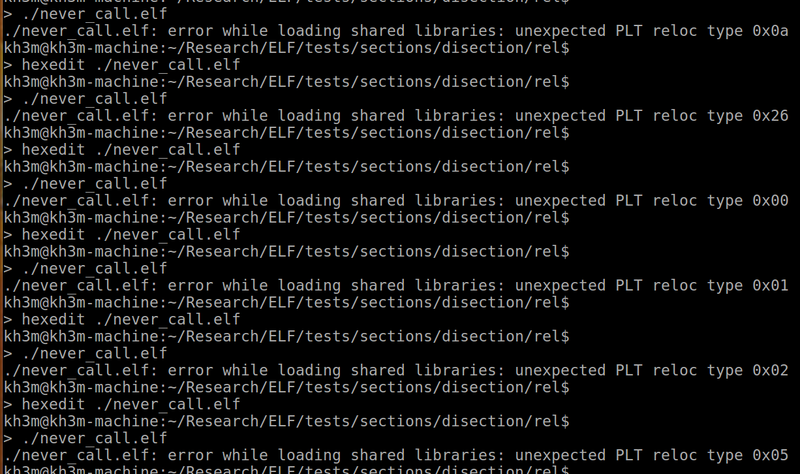 What happened here is when gdb tried to resolve the function it made use of the index value we changed. So we made the reloc point to a different index in the symbol table and it used this to resolve its definition resulting in the puts function being targeted instead. So we've learned that the r_info field is pretty powerful when it comes to driving function identification in some contexts(2). Beyond that we can also look at how malformed r_offset values affect execution. On the right we have the binary that was edited, on the left we have the original. 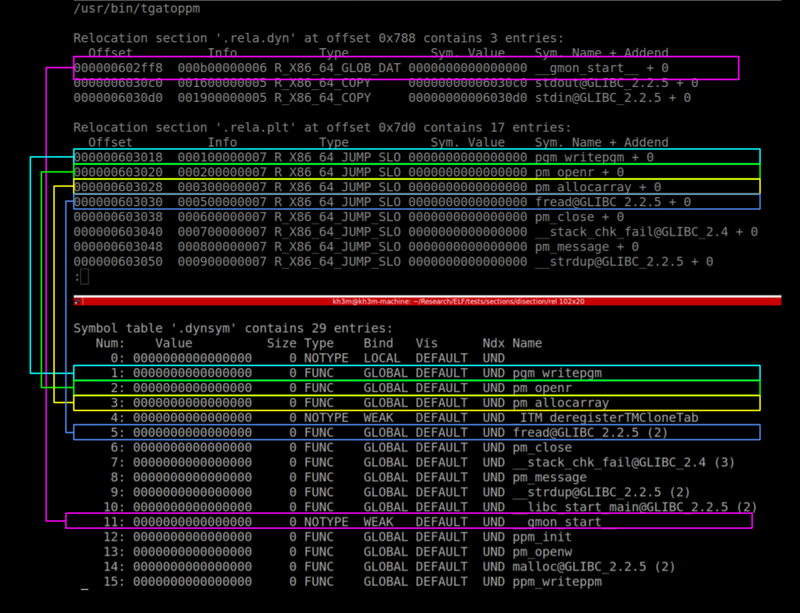 In this gdb session I set a breakpoint to the call in the PLT at 0x400420 ; this invokes the __dl_runtime_resolve which handles patching, and looking up symbols. 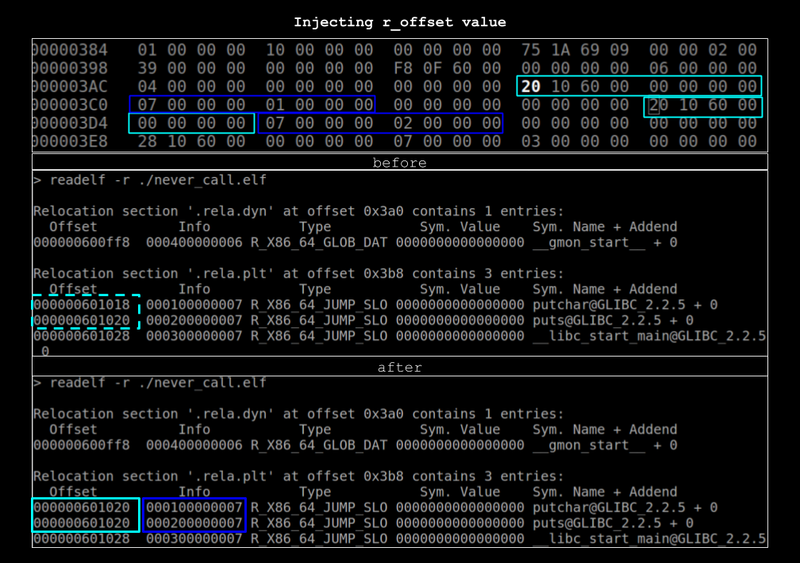 As you can see, comparing both of them when we messed with the symbol r_offset, it causes the dl_runtime call to happen one more time than in the original. As for the r_type value (which is defined as a certain bit offset in r_info), I pretty much tried injecting others; but learned that the runtime has consistency checks on the types. 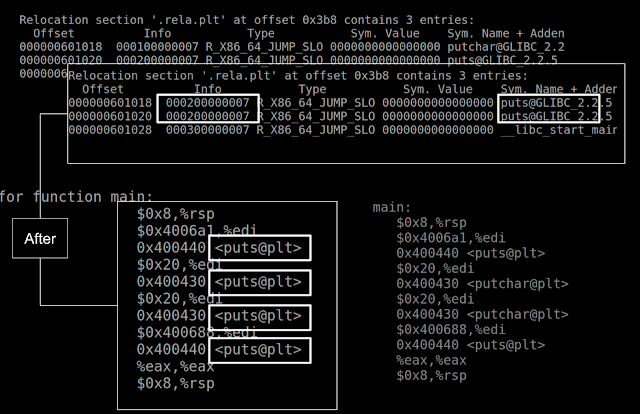 There many other kinds of reloc sections that may allow for arbitrary r_types and all kinds of symbol remapping. If they exist and when I find them I'll dedicate a blog post to them. As you can see, whatever I try is outwardly rejected by the runtime, it won't have any of this nonsense lol. Anyway that's it for this one folks, stay tuned for the next post in this series covering some of the internals of dynamic linking and lazy loading ;). This means there must be other things we can do with it, perhaps inject functions into the binary or re-point functions at a key time in their lazy loading life-cycle or force a re-invocation of the run-time in a way that side channels information about the functions being called and therefore data being processed? maybe maybe lol Probably better addressed in a separate post.